Have you ever tried to crack open a nut by holding it between your teeth and giving it a good chomp? Sparrows, cardinals, grosbeaks and finches do this all the time, cracking open seeds and nuts with their short, stout, cone-shaped beaks. These beaks have some special features that make cracking easier: the edges of the lower mandible (the lower beak) fit into special grooves in the upper mandible (upper beak). 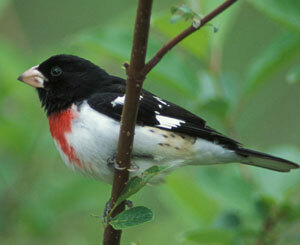 A bird with this type of specialized beak will use its tongue to maneuver seeds into the groove. When the bird closes its beak, the sharp lower mandible crushes the seed's shell so the bird can eat the seed within. Cracking beaks are usually thicker and stronger than other types of beaks. The size of a bird's beak can help indicate the kind of seed or nut the bird is adapted to eat. For example, the smaller beak of an American Goldfinch is perfect for eating small seeds like thistle, while the larger beaks of the Cardinal or Rose-breasted Grosbeak (right) are good for eating large seeds like sunflower. The crossbill gets its name from its truly unique beak. 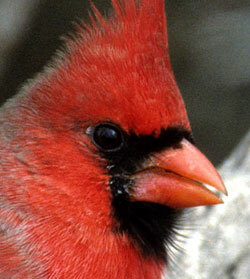 The tips of its upper and lower beaks are crossed – they don't line up evenly like most bird beaks do. A crossbill uses this special beak for a special purpose: prying pinecone scales apart. Once the scales are parted, the crossbill uses its strong tongue to detach and grab the pinecone seed. 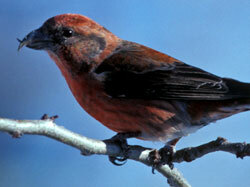 Crossbills can also use their fancy beaks to eat fruit, insects, and other seeds.